Urban occupations will grow faster over the next ten years than suburban and rural occupations. The metros with most favorable job mix for growth are Durham-Chapel Hill, New Haven, and San Jose. The ups and downs of local job and housing markets are often tied to the fates of their key industries. Whether it’s tech in the Bay Area, oil in Houston, or manufacturing across much of the Midwest, the local job mix matters. Yesterday the Bureau of Labor Statistics released its ten-year projections for occupational growth. This post shows which occupations are projected to grow or decline most; it also demonstrates the profound effect aging will have on labor demand and labor supply, and how the projections are good news for women and the well-educated. Healthcare-related occupations, along with personal care and computer & mathematical occupations, will grow fastest, while production (i.e. manufacturing) and farming/forestry/fishing occupations are projected to decline. Which local markets are favored with fast-growing occupations or saddled with declining ones? I combined BLS national occupational projections for 2014-2024 with Census data on where occupations are located today, based on place of work (see note). What do artists and economists have in common? Not much — aside from being the two most urban occupations. More than 60% of both actors and economists are in big, dense cities. But the most urban occupations also include in-person services where local demand is strongest in big cities, like taxi drivers, parking-lot attendants, and elevator installers and repairers. The differences in overall projected occupational growth across areas aren’t huge, and that’s because only some occupations tend to be clustered in certain areas. Many large occupations, like secretaries, cashiers, elementary school teachers, and retail salespeople, are almost everywhere, so the occupational mix varies less across different locations that you might think. Still, growth in occupations that don’t just serve the local population — like software developers or petroleum engineers — tends to boost growth in other occupations that do service the local population. For instance, if tech is booming and the oil industry is shrinking, then growth in other occupations catering to tech and oil workers — such as retail and personal services — could be faster in tech-heavy San Jose than in oil-dependent Houston. 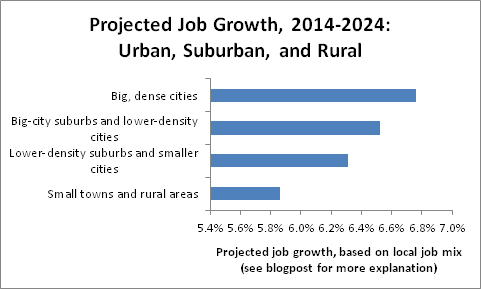 (Economists call this “local multipliers.”) Therefore, the projected differences across areas in occupational growth, shown above, probably understate the important of job mix to local growth. The same method shows which local markets have the most and least favorable job mixes. Among all metropolitan areas with at least half a million people, Durham-Chapel Hill, NC, has the most favorable job mix for future growth, followed by New Haven and San Jose. Several of these top ten have large local tech industries, including Durham-Chapel Hill, San Jose, Boston, and Washington, DC. Many are among America’s most expensive markets. What accounts for McAllen-Edinburg-Mission, a large, low-income Texas border metro? There, many people work in the growing occupations of home health and personal care, and relatively few in declining routine office occupations. The inland California metros of Bakersfield, Fresno, and Stockton have the least favorable mix. These metros have young populations and therefore relatively few people in healthcare jobs; furthermore, they have substantial agricultural industries, and Bakersfield has a significant oil and gas industry as well. Largely absent from this list are Midwestern markets, despite their historical reliance on manufacturing. The differences between metros are very small. Large metros aren’t as different in their occupational mix as you might think. Plus, remember that this approach might understate the impact of job mix on local growth because of the assumption that any given occupation will grow at the same rate in all places; that is, this approach ignores any multiplier effect. But job mix isn’t necessarily local destiny. People move not only for jobs but also for personal reasons and for housing affordability. Places where geography or regulations (or both) limit new housing construction could have slower job growth than predicted by their job mix: failing to accommodate booming local industries with more housing could lead to higher housing prices rather than faster job growth. Other state and local policies, too, could also boost or constrain growth relative to what the job mix alone would predict. And places that aging baby boomers eventually move to could see larger-than-expected growth in healthcare jobs and other services that retirees consume. Still, a local area’s job mix is a tailwind or headwind for future growth. Some fast-growing occupations are clustered in particular places, as are some fast-declining industries. Whether the occupations and industries that lead U.S. economic growth are as predicted or are full of surprises, the local job mix will be a blessing for some markets and a curse for others. Note: Employment projections are from the Bureau of Labor Statistics (BLS), and the location of workers is from the American Community Survey (ACS). The 818 BLS occupation codes were combined as necessary to match the 473 ACS occupation codes. Location of workers was based on Place of Work Public Use Microdata Areas (PUMAs), which are aggregations of residential PUMAs and are typically equivalent to counties in more urban areas or groups of counties in more rural areas. Place of Work PUMA’s were classified by tract-weighted household density into big, dense cities (weighted density of 2000+ households per square mile); big-city suburbs and lower-density cities (1000-2000); lower-density suburbs and smaller cities (500-1000); and small towns and rural areas (0-500). Approximately 30% of jobs are in big, dense cities; 30% in big-city suburbs and lower-density cities; 20% in lower-density suburbs and smaller cities; and 20% in small towns and rural areas. Data on the location of workers are from the ACS Public Use Microdata Sample (PUMS), 2012-2014. ACS data were downloaded from IPUMS, which requests to be cited as: Steven Ruggles, Katie Genadek, Ronald Goeken, Josiah Grover, and Matthew Sobek. Integrated Public Use Microdata Series: Version 6.0 [Machine-readable database]. Minneapolis: University of Minnesota, 2015. This entry was posted in Uncategorized on December 9, 2015 by Jed.